PRODUCT DESCRIPTION: Small cigar sized box that uses sound to repel nuisance animals. It has features which make it ideal for outdoor applications including a built in motion detector, variable settings, weatherproof casing and the option of running it on AC power or "C" cell batteries. The motion detector has a range of approximately 35 ft x 70 ft but the sound can cover open areas up to 5000 sq/ft. This unit has a wide range of settings and will prove effective for animals like Armadillo, Bats, Bobcats, Cats, Coyote, Dogs, Deer, Fox, Javelina, Marmots, Mice, Pigs, Rabbits, Rats, Raccoon, Rock Chucks, Skunk and Wild Hogs. It also works for Squirrels. It comes with an AC power converter that can be used to power the unit via an electric outlet and should be used this way if you wish to run it continuously. The included power cord is over 35 feet long (lengths vary from 35-40 feet) and it can be lengthened if desired (it uses standard 12 volt gauge electric cord and you can easily splice additional lengths to it if you need longer lengths). You can also power it with 4 "C" cell batteries and when powering it by batteries, you should have it set to "motion detector" monitoring. Since the unit will only use power when activated, the batteries should last several months (don't run it continuously with batteries as this will "kill" the batteries within a week). 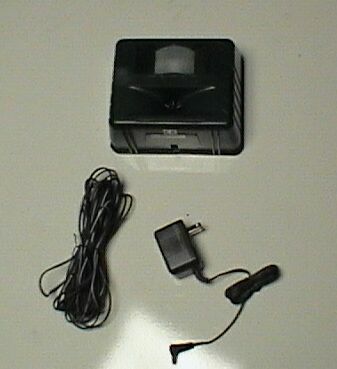 The sound settings are adjusted by dialing a rotating switch located on the back of the unit (see video below for complete directions and a demonstration). Target animals are all listed on the unit and can be "dialed" in as needed. The sound travels in the path much like the light coming from a flashlight; its approximately 45 degrees wide. Think of the path like a slice of "pizza"; the tip of the slice would be where the sound starts and by the time it reaches the "crust", its about that wide. Now in open areas with no vegetation, the width is wider. Maybe 60 degrees. But if there is a lot of undergrowth, shrubs, bushes, etc. the sound waves will get broken up, distorted and effectively reduced. There is also a slide switch for power options. These settings include Off, AC only and AC/Battery. When set to AC/Battery, the unit will use the batteries when electricity is not available so use this setting if you intend on powering it by batteries. This unit is weatherproof and should be installed where pest animals are actively seeking food or harborage. PRODUCT SIZE: 7" Wide by 6" Tall by 4" Deep. WHERE TO USE IT: Ultra Sound is a sound which many animals can hear but has limitations. First, it is very much directional. This means you must be directly in it's line – much like a beam of light from a flashlight – to hear it. Second, Ultra Sound does not penetrate anything solid. This means it cannot go through walls, plants, around buildings, etc. It is effective only in the area directly in front of where a unit is placed and depending on the placement, anywhere from 1000 to 5000 sq/ft. Third, Ultra Sound has a wide frequency range and generally one range which might bother one animal will not bother another. For this reason any good unit will either emit a variable sound pattern or allow you to adjust the setting. Fourth, do not use these to protect any kind of food in the yard. Fruits and vegetables – especially those grown in the garden – will be too attractive for most any animal to ignore and they will usually forego the discomfort of sound to get a good meal. ** SPECIAL NOTE ABOUT PETS ** The use of Ultra Sound cannot injure animals including pets. As explained above, the sounds emitted will make certain animals uncomfortable and want to move elsewhere. But the range of sound is variable and specific. That means if you are trying to repel rats or bats and dial in that setting, dogs and cats won't mind the sound even though they can hear it. What if you have a dog but want to use the ultrasound to keep away bobcats? You can utilize the Ultra Sound in this scenario with no reason to be concerned for your dog. Here's why. First, Ultra Sound is not a "damaging" sound. It's just a "scary" sound to animals that can hear it. Basically its in a frequency range that serves to alert animals that something is maybe under duress nearby and therefore this area might have a potential hazard somewhere. So hearing the sound will not hurt or have any impact to resident animals like dogs or cats other than to pique their interest. Second, the impact of the sound only works on rogue animals and not the ones that belong. So when set up and turned on somewhere on your property – the land your dog knows to be his land – only invading animals will be wary of the sound and not the animals which already live there. Now yeah your pet might want to check it out to see what it is but once it sees the device, it won't quickly loose interest because he will know its not an actual animal making the sound. In fact this is the reason why we don't sell these to chase away established nesting animals; ultra sound will only work to repel animals that are foraging onto land they don't normally occupy. The reason for this is animals that don't belong won't behave like your pet if they hear it. Basically once they sense the sound they will move away with no interest in having to know what might be making it. Third, ultra sound is very directional and moves away from the unit like light from a flashlight. So if you place units along your property line pointing out and away from your home and yard, you and your pets won't be in direct line with the sound and therefore will barely (maybe never) detect it. Basically the sound only travels in one direction (not backward) so you can't hear much of it from behind the unit. Is there any chance there is a setting on this to repel black vultures? Which ultra sonic device is specific to ward off bobcats? There aren't any devices "specific" for bobcats. 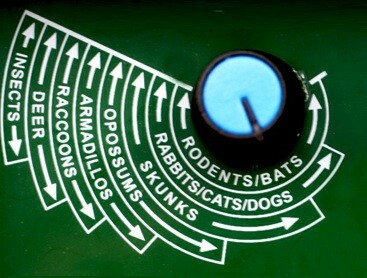 In fact its rare that any manufacturer would limit their production to just one animal so even the devices which target rats or birds or other animals will in fact be labeled for a wide range of targets depending on the frequency range built into the adjustments. No doubt different frequencies affect different animals so when these machines are designed, they're usually adjustable so the frequency setting can be manipulated and such is the case with the one you'll want to use for bobcats. So with that being said, we've learned over the years that we have 2-3 units that can do the job. But no doubt the "best" unit is the one on this page – the Yard Gard. The key is to keep it set to "always on". This means you'll have to run it 24 hours a day; 7 days a week. And that means powering it by battery won't work so you'll need to use the included AC converter and run a power line to the device. But if you can install the unit where you can run it 24/7, it will effectively ward off bobcats since they do not like the sound and will avoid the area where the sound is heard. I want to keep stray cats away from my bird feeder on my porch. There is one cat in particular that has already killed a bird as of this morning. It sits in the exact same spot on my porch every morning waiting to attack one. If I am using the AC adapter instead of the battery with this device, does that mean it is always making the sound… or is it still only motion activated at this point? Also, the description says that the cat has to be directly in front of the device to even hear it… if that is true, how can it cover up to 5000 square feet? Also, will the sound scare away the birds trying to eat from my feeder? I really want to get something to keep this cat (and all cats) away from my feeder area. I'm just hesitant because it is a porch where steps are involved and many levels for the cat to sit and wait. Will this product be effective in my situation? I believe you can get the desired results using this unit. And to help clarify how, here are some answers to your questions. First, the unit has two settings and two power options. The first "on" setting is controlled and activated by motion only. The second "on" setting is a continuously on option. As for power, you can run the unit via batteries or by the included power converter. Now if you choose to use the power converter, you can still use either of the power "on" options. But if you choose to use batteries, the option of keeping it "on" all the time will cause the batteries to run out in few days so for obvious reasons, one should not use batteries if they wish to keep the unit always on. But if you choose to use the AC power converter, you can use it with either setting. Second, the area the unit will cover is up to 5000 sq/ft. Think of a flashlight. It projects a light beam that gets wider and wider. And the same thing happens with the sound waves emitted by this device. So if you position the unit 15-25 feet away from the area you want to protect but keep the unit pointed at the area, you will be able to blanket the space with the sound. And this can be accomplished by placing the unit up off the ground or at ground level. Basically it's versatile and designed to fit most any need. But if you're struggling on where to place it, email us some pics of the area and we'll be able to offer some options once we get to look over where you want to use, what you want to protect, etc. As for the sound affecting birds; this typically isn't a problem when the unit is set to repel cats. Basically there are multiple settings and the sound wave setting used to repel cats usually won't bother birds. In summary, if you are able to target the sound waves at the area you want to target, you should be able to repel unwanted cats. And you should be able to do so without repelling the birds. Now keep in mind that using multiple units may be required depending on the layout of the porch, etc. Again, this is something I can't say without seeing the areas involved. I was interested in keeping bob cats off of a roof, so they will not jump in the yard and attack my small dogs. Will that work and how would it secure to the roof without blowing off? The unit above can do the job. It definitely sends out a signal bobcats don't like and they will avoid areas protected by the sound. And mounting it on the roof is definitely a common application (not necessarily for bobcats but for other animals). The unit has "mounting holes" located on the removable back side cover. You can see them in the short video posted above. These holes are designed for nail or screw heads so to mount it anywhere, you need to first secure two nails or screws onto the surface where you want it mounted. So for a roof mount, I have seen several configurations used. The most common is to use 2×4's and build a small cross wide enough to at least span the back of the unit. On this cross section you'll mount screws or nails so the unit can hang on the cross section. The height of the cross will depend on how high you want the unit to rise above the mounted surface. Its typically 2-3 feet tall but I've seen it higher. Especially when used in the yard to "stake" a mounting cross. On a roof, it usually doesn't have to be too high. Next, the base of the cross is either mounted on a chimney, the side of the home or some other part of the structure using deck screws or large nails. I have also seen where the cross is simply anchored to a cinder block and then the cinder block is laid on the roof. This configuration allows the unit to be moved around as needed which can be handy and ideal for temporary installation. Lastly, I've also seen the cross get mounted to a small base made of 2×4's which are constructed large enough to remain stable when place on the roof. This base can be a simple "box" like frame with the unit mounted on any of the four side beams. Again, this configuration is portable and should be small enough to be moved onto and off of the roof as is needed. Let me know if you need any further help configuring a mounting configuration and we can assist. Many of our customers will send pictures of the areas involved around their home and once we see pics, we can usually come up with some suggestions. I live in Tucson. I have a small front yard with a desert oak tree that takes up most of the yard. Seasonally, the tree drops acorns which attract javelina at night. I would like to keep them away, as they really mess up my yard. I've tried spraying mountain lion urine along the yard's perimeter. But because my yard is so small they easily override the smell in their quest for food. Can you help? As you'll see in the article, the Ultra Sound unit pictured above is one option that can be deployed. Just be sure to keep it running all the time which means you'll need to power it with the included AC power supply. Two other options that have proven effective include the Deer Off Spray which can be applied directly over the nuts as they lay on the ground. Once sprayed, they will taste bad which will usually deter any animal from feeding on them. Lastly, the Motion Activated Water Sprayer has also proven effective at scaring them away and can cover quite a large area. I need something that will keep my dogs from digging up my lawn. Will this device do the trick? If not, any suggestions? So with that being said, if you run the unit 24/7, they will no doubt avoid being in direct line of the sound. 24/7 means you'll want to power it using the included AC converter and keep the switch to "always on" mode. I am looking for something that will keep mice and other rodents out of my cabin. Will this product work if I keep it on all the time? I do not have electricity but run everything off solar panels and 12 v batteries. Its definitely the "best" small rodent option. This unit (the Yard Gard above) is for outside applications and though it will work on small animals, its not nearly as species specific as the Transonic. Thank you for your Q&A section. I am purchasing a house in FL that borders woods on one side. There is a 6' chain link fence. The area is prone to bobcats. I have 7 cats and a yorkie. I am getting the Purrrrfect fence overhang to keep the cats on but I'm scared a bobcat will jump over the fence. Will this keep them at bay? How many would I need for 150' of fence? Placing units along the fence line directed "out" and away from the yard will send a signal through the fence and should do a great job of keeping away unwanted felines like Bobcat. Coverage would be 50-75 feet per unit so could try using 2 but since there is a discount when 3 or more are purchased, I recommend going with three. This will insure complete coverage with no "gaps" in the protected zones. Can the Yard Gard Ultra Sound Repeller be used around someone with a pacemaker? Thank you. No problem using this around anyone with a pacemaker. Remember, these units release nothing but a sound. Granted it might not be in a range people can hear. But animals can and as the information above explains, it will in turn be interpreted as either something "bad" or scary so they will stay away from where they hear it. But no animal will be harmed by it and these units are not designed to do anything like that anyway. I have a bat issue May through September at the front entry to my home. The house is stucco and the entry is quite recessed. We have a large pond about 150 feet from the rear of the house. Will this product deter the bats from the front entry? We have been fighting this battle for 7-8 years. Thanks! No doubt this device can help keep bats off your structure. But there are some rules you need to follow to get optimal results. First, the area should be power washed or at least hosed off using a garden hose. Next, you need to spray 2-3 gallons of mixed NNz over all surfaces (ceiling, siding, etc). Bats rely on pheromones and marking scent to locate roost sites and I'm certain this area is covered in their "smell". In attic spaces, its an easy odor to notice. Outside in an open space, this odor can be overlooked. But if you want to get long lasting results, you need to take away that which is attracting them. Remember, bats don't see well so they're not flying through the night, seeing your house and concluding "hey, this would be a great place to roost". What is happening is that as they are flying past your home, they're picking up some "scent" which gets their attention. And once they investigate, the opportunity becomes clear and they take advantage. Spray as much of the structure with NNz to eliminate the reason they're coming around. NNz won't hurt the surface of your home, the plants underneath, etc. And since detergents or bleach won't get rid of the bat smell, the NNz should be applied after you clean. Mix 8 oz per gallon of water and plan on getting around 500 sq/ft of coverage per mixed gallon. Results are immediate and treating as much of the home as possible is suggested. Second, its generally best to run these machines around the clock, 24/7. This ensures there is no "dead" time allowing target animals to "sneak in" when its off. Bats will detect the sound if its always on and since these units require very little power to run continuously, use the included power supply brick to keep them on all the time. So to be clear, do not use it powered by batteries set to motion detector. Instead, use the included power supply brick and set to "always on". Now how long will they be needed? If you treat with the NNz, you should force the bats elsewhere when they return this spring and once they find another place to roost, they shouldn't come back. So in general, plan on running it for one month and then if you want to turn it off to see if the bats come back or not, that would work. Obviously running it around the clock from spring through summer is an option and since it only costs $.25-.50 to run a month, the cost is nominal. But if you force the bats elsewhere in the spring when they return, you can usually turn them off as summer arrives and not have to worry about turning them back on until the following spring. Now if you don't descent the home with NNz, expect to keep the unit running around the clock, indefinitely since active bats will be looking to roost on your home as long as scent is detected.